Now that station where the cubical quad was made famous is in jeopardy of permanent closure. 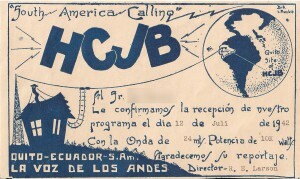 Fifteen years I visited the HCJB Quito studios and the Pifo transmitter and antenna site. The Quito studios and equipment were cast in the 50s; reel-to-reel tape decks, et all, but the Pifo site was quite something to behold; the Sterba Curtain array, the cubical quad and other antennas and then to literally walk into the 500,000 watt transmitter. The RF and modulator sections were on the left of the isle facing towards the control room, the power supply on the right immediately above a large swimming pool. The pool water was heated for the Pifo transmitter staff and family use by circulating it through the transmitter. There were four other smaller transmitters in the same building, a 100 watter, a 1 kW, a 50 kW and a 250 kW. Switching antennas from one transmitter to another, or changing directions, was literally done by hand-throwing huge knife-type switches in the building attic. One needed to be very careful in the attic where OSHA would have never ventured. The entrance door foyer to the building has two glass cases showing “mistakes” in engineering; melted tubes, melted and charred insulators, transmission line, those things that happen in a high RF environment. Even as HCJB World Radio has begun dismantling shortwave radio antennas at its Ecuador broadcast site in Pifo, strategic opportunities for spreading the gospel via radio are emerging for the mission. To accommodate new international airport construction near the capital city of Quito, missionary engineers and national staff have lowered a two-antenna curtain array that Radio Station HCJB, the “Voice of the Andes,” formerly used to air programs to the South Pacific and Europe. In 2003 the mission switched to local and regional AM and FM broadcasts in these regions while refocusing its Ecuador-based international shortwave outreach on Latin America. Other antennas will also be dismantled in accordance with the mission’s late-December agreement with the Quito Airport Corporation (CORPAQ) which is compensating the mission for labor, but not providing funds for new site construction. “We know that 30 towers at the Pifo site have to come down by December 2007,” explained Jim Estes, director of HCJB World Radio’s Latin America region, referring to antenna systems that could obstruct the approach of landing planes. Pifo is a town about 15 miles east of Quito. Of 48 towers sustaining 32 antenna systems on the 110-acre site, another 18 lower-height antennas—whose signals do reach Latin America—will not impede approach. But those too will be dismantled by the time airport operations are expected to begin in 2009. A 100-kilowatt transmitter has already been shipped from Pifo to HCJB World Radio-Australia’s shortwave site at Kununurra. That facility began transmissions in mostly Asian languages (in addition to English) in January 2003. Staff at the Australian site expect the transmitter to be on the air by early April. Changes at Pifo are not expected to diminish the mission’s participation in the World by Radio (previously known as World by 2000) effort begun in 1985 whereby Christian international broadcasters committed to make gospel broadcasts available in all the world’s major languages. Of more than a dozen languages that air from Australia, two—Bhojpuri and Chattisgarhi, both spoken in India—are World by Radio languages. Still other World by Radio languages are aired by local stations and networks worldwide. “We’re involved in radio all around the world, but our involvement is much different than what we’ve done historically here from Ecuador,” Estes said. “It’s more of an involvement where we’re helping local people develop their radio ministries to reach their own people. 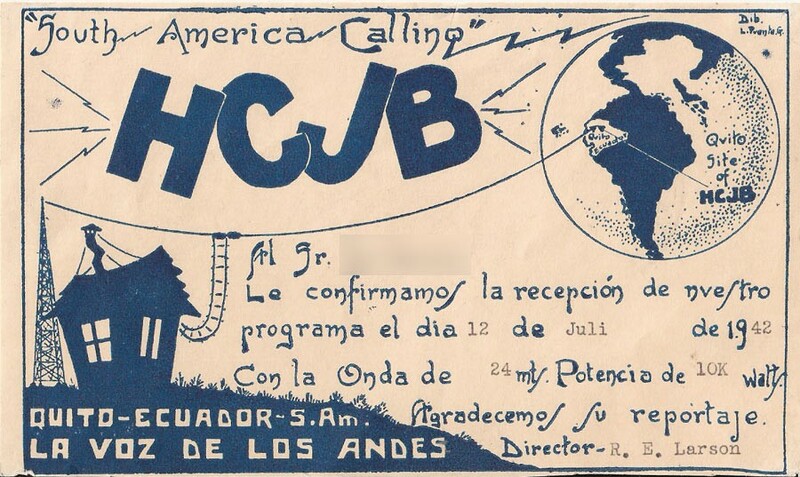 “Here in Latin America we’ve helped [radio ministries] everywhere from Buenos Aires up to Havana with such things as studios, equipment, technical advice and training on how to do radio,” he added. “It’s quite exciting to see.” Since the 1990s the mission has aided local Christian radio endeavors in some 300 cities in more than 100 countries while facilitating network programming via satellite in all but one of its five global regions. Assistance to local partners is facilitated by the engineering center, and the center’s pioneering work in digital shortwave radio also presses on, with continued development and testing of Digital Radio Mondial (DRM) equipment —digital broadcasting for the shortwave transmitters produced there. An announcement 10 years ago had alerted the mission’s engineers that Quito’s long-awaited new airport might be built just six miles from the mission’s shortwave facilities at Pifo. Impending changes looked more certain by mid-1997 when aviation authorities said that due to potential interference, HCJB needed to dismantle its Pifo installations. Subsequent plans to dismantle and move the Pifo installation to Ecuador’s coast were first tabled in 2003 by mission leadership, and later scrapped due to concerns about increased energy costs. Electricity for the high-powered transmitters has been generated at a mission-built hydroelectric plant in nearby Papallacta. I had the good fortune of visiting the site at Pifo many times between 1968 and 1973. At the time, I lived and worked in Quito. What a shame it is to have had to dismantle the station that meant so much not only to people around the world but to people all over Ecuador. The government has no idea what a dis-service they have done their own people when they lost HCJB. Talk about political stupidity at the highest level. I hope they realize what they lost.